You most likely have heard of asbestos and how it causes terrible diseases like mesothelioma, but what is it and why is it so dangerous? During Asbestos Awareness Week 2018, it is important to acknowledge the seriousness of this substance and how you may be at risk. 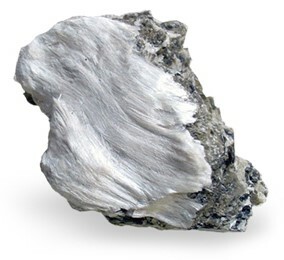 Asbestos is a naturally occurring mineral made up of long crystal fibers. These fibers are malleable, extremely strong, and are resistant to heat and electricity. These tenacious properties became widely known and spurred the mineral to be greatly used throughout the world for a majority of the 1900s. It was used mainly for insulation purposes and could be found in numerous households and businesses from floor tiles, roofing shingles, and even in clothing. Veterans were most exposed to asbestos because the substance was highly valued by the armed forces for its fireproofing purposes. Asbestos could be found in numerous locations on naval ships including sleeping quarters, boiler rooms and navigation rooms. It was also used extensively for construction on army bases and could be found in cement, siding, flooring, drywall and insulation. The fact that asbestos is such a durable product seems great in theory, but it’s strength is also the thing that causes it to be extremely dangerous. Asbestos fibers are very small, hard to detect, and easy to mistakenly inhale. Once inhaled, the fibers rarely leave the body, and because they are so strong, they never dissolve. Asbestos fibers most commonly embed within the lining of the lungs, which over time causes inflammation and scarring. Fibers can also be accidentally ingested and enter the lining of the stomach. This scarring can cause damage to cells’ DNA and causes uncontrolled cell growth—which then leads to the development of mesothelioma, a deadly and incurable cancer. After exposure, it takes anywhere between 20-40 years for mesothelioma to develop. Roughly 3,000 people in the United States are diagnosed with the disease each year. Life expectancy varies depending on the type of mesothelioma developed, but typically falls within the range of 12-22 months after diagnosis. The widespread use of asbestos has since diminished after its carcinogenic effects were publicized, although the World Health Organization estimates that about 125 million people in the world are still currently exposed to asbestos in the workplace. The substance has now been banned in over 50 countries but is still allowed in one major country—the United States. Asbestos is no longer mined in the states and its use has significantly declined. However, the U.S still legally imports, utilizes and sells asbestos and products made with this potentially deadly substance. These facts make it extremely important that Americans are aware of asbestos, it’s use and how they can be exposed.